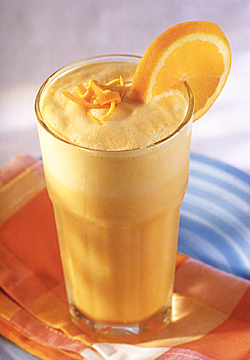 The original Orange Julius was created at Julius Freed’s orange juice stand in 1926 with the help of his friend Bill Hamlin who wanted to create an orange juice drink that was less acidic so as not to upset his stomach. After playing around with some complimentary ingredients, the delicious, creamy and frothy Orange Julius was born. Though the Orange Julius recipe still to this day remains a trade secret, and no doubt even the original recipe has morphed over time to meet today’s customer tastes and the inevitable food safety regulations ( raw egg whites were most likely used in original formula where now their top secret powder blend includes “dairy and egg products, specifically whey powder and egg white solids.” *taken from Orange Julius® corporate website. Here’s how to make an orange julius: Combine all ingredients in the blender and blend on medium to high for 45-60 seconds, until the mixture if smooth and has the characteristic froth. You can use less ice if you want a more juice like consistency. The more ice you add the more smoothie-like your beverage will become. If you are nervous about raw egg whites there are powdered egg white products on the market you play around with as well. The substitution of banana instead of egg white will add an interesting creaminess flavor. Combine all ingredients in the blender and blend on medium to high for 45-60 seconds, until the mixture if smooth and has the characteristic froth. You can use less ice since the banana will be frozen. – try to use fresh orange juice, not pasteurized. You’ll notice the difference! – Try powdered sugar instead of normal sugar which can help with the texture and froth. – Freeze the orange juice in an ice cube tray ahead of time, then you do not need to add the ice cubes later.